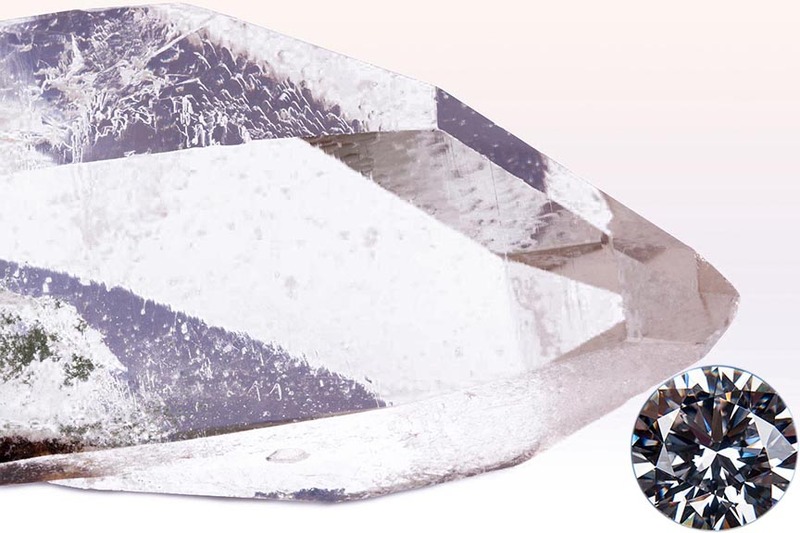 What can Diamond, April’s birth stone do for you this month? Did you read last month’s blog post which was about Aquamarine, click here to read it. This month I’m going to be sharing what there is to know about diamond and how April’s birth stone can help you. I will also be looking at the more affordable clear quartz which is also linked to April. As much as I’d like to tell you about diamonds and healing, realistically they are a little too expensive for most healers to use in healing, so I’ll focus more on clear quartz. But I won’t forget the diamonds. Clear quartz is all about strength as in inner strength. There are things that can hinder that innate inner strength that we have that somehow often dissipates. But it doesn’t mean that it’s lost forever. We can regain it. Many years ago, while working in the corporate world, I had a very strained relationship with a co-worker, and I never understood what I had done to upset her. One minute she was all pally, and the next she wasn’t speaking to me. We worked together like this for several years and eventually she left the company. But then she called on me for my expertise on something and I was invited to her home, whereupon I learnt what the issue was for all those years. She pronounced ‘you’re so strong, you always know what you want’, which was very flattering. However, she also learnt something that day, and that was I never felt confident, I worried about how good a job I was doing, and did they like me. So basically, I had little self‑esteem, little self-worth and my confidence on the inside wasn’t great. One the outside, I was clearly telling a different story. But it’s the one on the inside that’s really important to us. So, is this you, full of bravado outwardly, but trying not to shrivel up inwardly? Are you thinking about what others think of you all the time and trying to match up to what you think they expect you to be? Do you look for reassurance on how you look, your general appearance (does my bum look big etc), for the dinner you’ve just put in front of your family, does it taste OK, for the job you’ve been tasked to do? Moments of doubt are one thing, but if this type of thing is a pattern, it’s good to get some help from elsewhere. And this is where clear quartz and crystal healing can really shine. Clear quartz is able to help us really clarify our issue and then go on to strengthen us so that we can deal with the matter in the most effective way and transmute it. It allows us to get very focused on what we want and is very supporting to us. Thinking about this, and now think about diamonds. 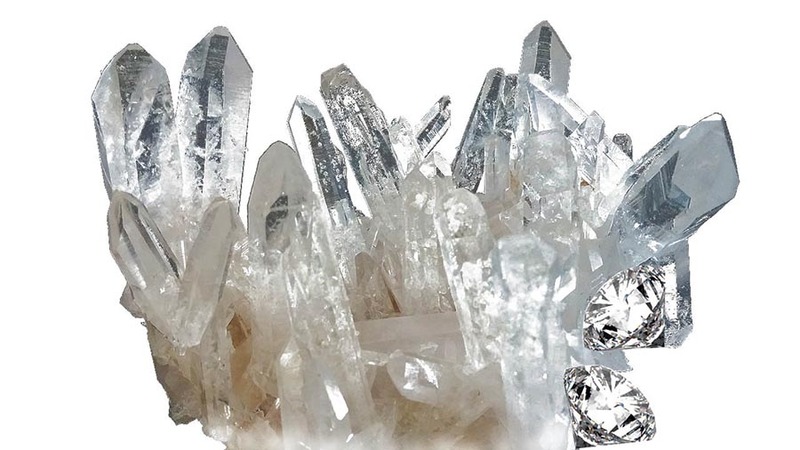 In comparison to clear quartz, they are very, very strong and very intense, which is another reason why diamonds are rarely used in crystal healing; their healing energies are often simply too much for a person to deal with. Wearing them as rings, earrings etc. is absolutely fine, as we are not channelling energy into them, so please don’t worry. You’ve worn your diamonds up to now with no ill effect and there’s no reason for this to change. Quartz, being the largest family on the planet, comes in a variety of colours due to inclusions of certain minerals within it. However clear quartz is what is says on the tin. It is clear and transparent. When looking at clusters, it usually presents as slightly more opaque towards to the base of the matrix, and becoming crystal clear towards the top. Occasionally some clear quartz can have an almost rusty tint to it. Diamonds, although usually clear and transparent, can actually be any colour and transparent. Depending on the colour, they can be much more expensive that the familiar clear diamonds. Diamonds are beautiful whatever colour they may be. Clear quartz can be found all over the world and in most countries, even the UK. It is the most common crystal on earth and is very easily obtainable. Diamonds can be found in several locations around the world, namely Australia, Brazil, Russia, USA, India and of course Africa where the famous Kimberlite diamond mines are found. Judging by the number of diamonds adorning women’s fingers around the world, clearly, they are not rare, although perhaps their price is kept artificially high. Clear quartz is piezo-electric, which means it’s sensitive to pressure. For healing purposes this means they affect pace-makers and therefore should not be used on people with pace‑makers. Crystals from other families, which are not quartz are OK in this type of situation. People often talk about energising their crystals in sunlight, and while taking your clear quartz crystals outside for brief periods can be very beneficial to them, please be aware that if direct sunlight catches them at a particular angle and refracts off the surface of the crystal, there is a possibility that anything flammable around could catch fire. Therefore, the moral of this story is to be alert when leaving your crystals outside, but also any clear quartz crystals you have indoors, for safety sake, perhaps position them out of direct sunlight. If you remember your chemistry lessons from school, you will know that diamonds are a type of carbon, the same basic stuff as coal, just heated a bit longer and at a higher temperature. In days gone by, kings and queens were thought to be closer to God than mere humans and diamonds were considered to be the channel for them communicate with the divine. Clear quartz can help with so many things. Discover more about clear quartz and other crystals. How I can help you with a crystal healing session? By having a crystal healing session, you can experience a clarity of purpose and strength of mind. Next month we will look at emerald.